But mismatched bridesmaid dresses can work, and they can look as cool as you’ve imagined it in your head (or on your Pinterest board). And today we’ve partnered up with Brideside, the online bridesmaid dress boutique that lets you shop tons of different styles in various price ranges with the help of a style consultant (because mix and match budgets are also a thing) to share our best tips on how to keep everyone happy with their wedding day outfits, and not lose your mind in the process. Before you even start down this road, first figure out your main objective in choosing mismatched bridesmaid dresses for your wedding party. It’s easy to fall prey to the misconception that telling people what to wear is an inconvenience. But don’t be mistaken: mismatched outfits can be just as much work for the ladies and gents involved as more traditional options. (And they said yes to doing this because they love you, presumably, and already signed on the line for a little inconvenience.) So get real about your motivations. Do you just not want another wedding planning project to manage? Or do you have a specific vision you’re trying to achieve (like the gorgeous mauve situation going on below)? Are you only concerned with making sure everyone is truly wearing something they love? Will you care if things don’t turn out the way you imagined them? Answering these questions will help you figure out how much involvement you want and how much you care about the outcome. For example, if you have a specific vision in mind, don’t just tell everyone to pick out a dress they love. Give direction. Similarly, know your crowd. If your friends don’t get dressed up except for weddings and funerals, it may be more stressful for them to have to pick things out of thin air than if you give suggestions. That said, don’t feel like you have to manage this all by yourself. Brideside has a team of style consultants on hand who would love nothing more than to manage this project for you. So feel free to delegate your vision to your Brideside style consultant, and then let them keep everyone on track so you don’t have to. Once you’ve figured out the why of your mismatched bridesmaid dresses, time to move to what. Starting with picking your palette. This is the one time when we’re going to strongly advocate for “colors” for your wedding. You can keep things broad with a color family (jewel tones), go with a general color (purple), or narrow it down to a specific shade (lilac). The trick is just to give your trusty shoppers an idea of where to start. (Hint: Remember those Brideside style consultants I mentioned above? Well they can also help you figure out what you like and even send you fabric swatches way before you start sending anyone ideas.) From there, figure out how much cohesion you want and choose your unifying elements. Pick a few (or all) of the following: color, length, material, pattern. Here are a few ways to make it work. Same Color Family, similar styles: Not everyone interprets color the same way (kelly green and lime green are technically both green, if you get my drift). So if you want everyone’s outfits to look mostly cohesive, choose a single shade and then stick with it. Set up a Pinterest board with your color choice(s) along with a few dress examples, send your team fabric swatches with your color(s), or work with the Brideside team to come up with a style board like the one above. It’ll make it easier for everyone to shop, and your style consultant can deal with answering the endless questions about whether your sister’s dress is more blush or bashful. Pro-tip: If you want cohesion without matchy-matchiness, send them one of those multi-color paint swatches that you can get at your local hardware store and assign each person to one of the shades. Those colors are meant to look good together. If you want everyone to show up in a similar style, give direction on length and material type. You don’t have to get as specific with your materials as chiffon or silk (though if you shop online at a place like Brideside, you can easily search and narrow by material type). But in general, something like long and flowy or short and structured or please nothing shiny should do the trick. Recommended for: You like the idea of a cohesive wedding party, but you don’t want to have to micromanage everyone’s selections. Ideally, everyone will be able to choose an outfit they’re more likely to wear again than a traditional bridesmaid dress, but you understand they might not become staples in their daily wear. Same Color family, different styles: If you’re not into so much matching, or just want to increase your chances of everyone being able to wear their outfit again, you can stick with one color (or color family) and let everyone dictate their own style. 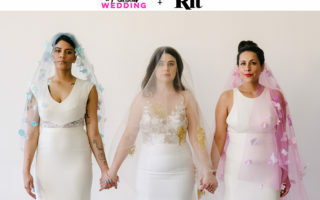 This is particularly good if your wedding party is made up lots of different body types, or very different personal styles, and you want to honor that. To avoid unintentionally matching, this setup tends to be easiest if your color is a neutral (black, grey, cream, gold, etc.) or if it’s otherwise available in abundance. If you still want some cohesion within your wedding party, I recommend agreeing on a level of formality before everyone goes shopping. A romper might look strange next to an evening gown, and you don’t want anyone feeling like they missed the memo on the dress code. Your Brideside account is a convenient place for you and your squad to save your favorite styles so you can easily see that everyone is in the same boat. Recommended for: You’re less concerned with how your wedding party is going to look together in photos than with making sure they’re going to get something they’ll definitely wear again. Or you have really stylish friends, and you want to let their individual tastes shine. different colors, different styles (and what the hell, let’s add a pattern! ): You can easily add more variety to the two concepts above by doing more than one color or adding print options. The key, once again, to keeping things cohesive is making sure there are some points of similarity. For example, you can do all cocktail-length pastel florals. Or a mixture of solids and prints within the same color family. Or all floor-length dresses in a combination of teal, maroon, and eggplant. (If you want a mix of colors like this, you might want to assign each person their own color. Your Brideside style consultant can be in charge of making sure you don’t end up with four out of five friends wearing teal and one person in eggplant feeling like the odd man out.) Since this kind of mismatching is a bit more advanced, just make sure to be realistic about your expectations, and know your crowd. Do you have super stylish friends who love to get dressed up and go out? Or are your people more jeans and t-shirt types? If you have a clear vision in mind, you can totally make the dress shopping process a collaborative one the same way you would if you were taking a more traditional bridesmaid dress shopping route. You know your people best, but remember that most wedding teams would rather have direction and get it right than be left to try and figure things out on their own (while worrying they’re going to disappoint you). Recommended for: You have a clear vision of how you want your wedding party to look. You don’t mind giving direction or being a bit more involved in the process so that everyone is on the same page. You’d like it if everyone ends up in an outfit they love, but you also understand that as the parameters get narrower, there’s a greater chance it might still go in the donate pile later (not everyone loves florals or jewel tones the way you might, and that’s okay). Ta-da! Hopefully this will save your bridesmaids from keeping silent while dishing out money for a dress they will never wear again. Plus, you get to feel in control without actually having to be The Boss. Trust in those career bridesmaids, like me, to send you many excited smartphone photos while we try things on. You won’t be sorry. SIGN UP HERE TO meet your personal style consultant today AND Get a FREE FLORAL ROBE FOR EVERY BRIDESMAID WHO orderS a dress from Brideside! This post was sponsored by Brideside, the complimentary styling service dedicated making bridesmaid dress shopping a piece of cake. With a selection of hundreds of dresses, in size 00–30, and a team of dedicated style consultants, Brideside hopes to make the dress shopping experience a more positive one for all your wedding party members. Shop online, use their Try At Home program, or visit one of their new showrooms. Click here to explore Brideside’s bridesmaid dress collection, or sign up to get matched with your free personal style consultant and receive a free floral robe with every bridesmaid dress purchase.